Although the Sandy Cove Sand Co Sand Mining Museum has yet to manifest, the rolling stock needed for a short length of track is already taking shape. One wagon was inspired by Penrhyn Quarry Railway worker's carriages – though, as ever, the management of Whittlecreek and Eaton St Torpid Heritage Railway cut costs. Why pay for new seats when some pews from a local chapel could be 'upcycled'? 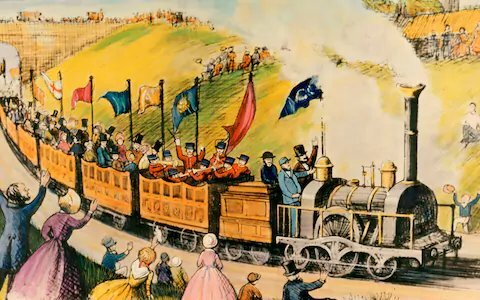 After the wagon with pew-like seats had been built it dawned on the management that there was a not-very-close approximation to the world's first excursion train, organised by Thomas Cook on 5th July 1841 (see illustration below). An imaginative reconstruction of the pioneering railway excursion from Leicester to Loughborough organised by Thomas Cook (1808–1892) in 1841. This did not inspire the wagon with pew-like seats. Though the idea of a brass band behind the loco is rather tempting… But the likely repertoire of Wesleyan hymns is distinctly less tempting. Thomas Cook's earliest excursions were to promote the temperance movement, although the company soon became synonymous with package holidays. Soon after 1998, when the company acquired the notoriously intemperate Club 18–30, Cook's mortal remains in Leicester's Welford Road cemetery entered the Guinness Book of Records as the most-frequently and fastest-rotating corpse-in-a-grave. The management seriously considered buying all the necessary parts of a small Lister-type petrol engine locomotive. However, after much prevarication deliberation (see below) they ultimately resolved to make this another scratchbuilding project. As and when this diminutive locomotive is made then two-foot gauge rolling stock will be running along a short length of track at the proposed sand mining museum. This will, of course, be quite separate to the three-foot gauge track of the Whittlecreek and Eaton St Torpid Heritage Railway, although there are plans for the Heritage Railway to eventually extend its track to the proposed Sandy Cove Sand Co sand mining museum. 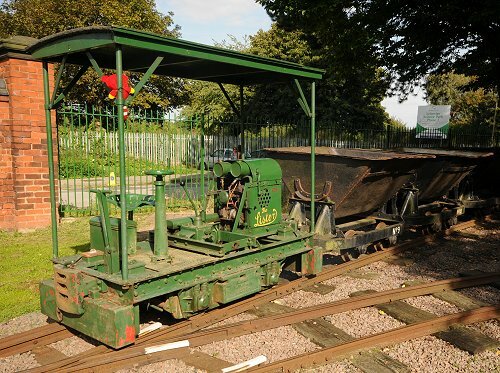 Initially Whittlecreek and Eaton St Torpid Heritage Railway's Lazybeach Special was based on four wagons adapted from Binnie Engineering kits of 32 mm gauge Gyn Valley Tramway four ton granite wagons, regauged to 45mm using different GVT axleboxes (also from Binnie Engineering). These were the first attempts at building rolling stock for Whittlecreek and Eaton St Torpid Heritage Railway and no suprise that they weren't really up to the mark. So new wagons were made for the Lazybeach Special and the GVT wagons regauged to the original 32 mm, but retaining the GVT axleboxes used for the 45 mm conversion. The pews are from lollipop sticks and kebab skewers. One of the wagons carries billboards for the Sandy Cove Sand Co museum, mounted on 'A'-frames made from coffee stirrers and cocktail sticks. To go with these three Binnie Engineering kits of Hudson hopper wagons were acquired and assembled. They are rather nicely done and make excellent models of a vehicle found on numerous mineral lines. Apart from a subtle difference to the tipping mechanism they are identical to the wagons in the photograph below. The kits were built 'as supplied' (a first for Whittlecreek and Eaton St Torpid Heritage Railway's Jackdaw Works!) and sprayed with a rust-effect paint. The Lister locomotive now at Abbey Pumping Station, Leicester. There seems to be no information about this loco online, apart from the suggestion it has a diesel engine. This is the deluxe model i.e. with a roof – usually the driver is unprotected from the weather. The management originally considered purchasing I P Engineering's Lister locomotive kit– they do both the petrol and diesel engine versions. However these are supplied as battery-powered, which makes operating backwards-and-forwards along a length of track rather tricky. So the wheels and subchassis would need redoing to make them insulated for track-fed power. Furthermore, the motor supplied is only 3 volts, making the usual model railway speed controllers unsuitable. So the management would save a useful amount of money – and all the hassle of 'kit bashing' compared to scratchbuilding – by tracking down a diecast 'tractor seat', brake stanchion, battery box, and maybe the distinctive grill. 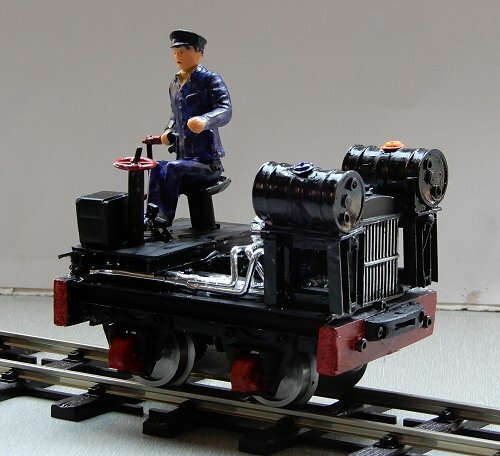 And Cambrian Model Rail seem to have most of these (if the woefully fuzzy photos on their online shop can be believed). But one of the annual garden railway shows is about three weeks away, so the management is holding fire. Update: The Cambrian Model Rail stall at the show did indeed provide a suitable seat. The Dream Steam stall provided some Peco SM32 track so the vehicle can be tested. As, at least for the foreseeable future, this loco will only get occassional use there is no need for a mains-fed power controller. The necessary 'juice' is supplied by a 12 volt battery holder wired up to a rotary potentiometer and a DPDT centre-off switch (for on-off and reversing the polarity) was fitted inside a suitable sized wooden box into which the necessary holes had been drilled. But what about the engine? Yes the 'fiddly bits' could be contrived from odds and sods from the bits boxes. But sitting on the shelf surplus to requirements is a 1/24 scale V8 hot rod engine. And as soon as the thought came into the management's mind, the ghost of Rowland Emett went 'Yes!' rather loudly in his right ear. Although that might be because the management is a trifle deaf in his left ear. 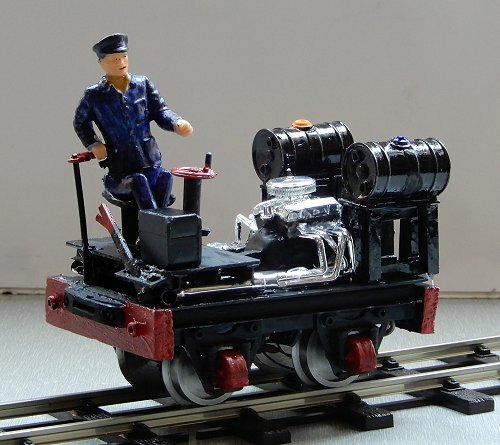 If anyone is aware of any of the surviving real world Lister locos (or even similarly diminutive locos by other manufacturers) having a ridiculous number of horsepowers shoehorned 'under the hood' then get in touch. Probably not, as 'drag racing' is not what steel wheels on metal track do at all well. The backlog of railway-related projects eventually cleared and increasingly-detailed construction sketches emerged from the Jackdaw Works drawing office while the backlog of non-railway projects ebbed and flowed. Most of the components were now in the 'company stores'. A Hornby motor and gears had been acquired from Peter's Spares. The set of Slater wheels were left over from I P Engineering coach kits used for the Welsh coach and the Houmout Ostrich Polo team transport wagon. The axle boxes, as usual, were from Binnie Engineering, then drilled out to 3.5 mm to take the ⅛" Slater axles (Binnie mouldings are designed to work with 3 mm axles, which are 0.1 mm smaller than ⅛") before being bolted to the 1.5 mm polystyrene sheet sole plates with M2 nuts and bolts. The rest of the chassis, apart from the wooden buffer beams, was also from polystryene sheet and 'L'- and 'H'-section profiles. The link-and-pin bumpers are also from Binnie Engineering. 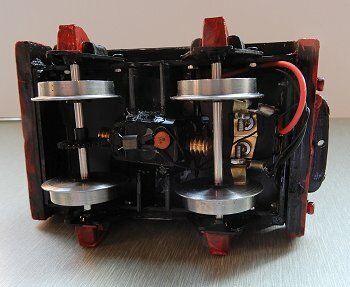 The motor, gears and and axle boxes are held in the right places with 1.5 mm polystyrene sheet. The electrical contacts are from 0.5 mm brass sheet bent to rub on the backs of one set of wheels. A 'power take off socket' was incorporated in the wiring to allow for some unplanned future addition – the nearest to anything planned is perhaps some sort of headlights or spotlight. Update: Some flashing yellow LEDs are on order to create 'hazard lights'. These will be fed via a homemade zenner diode circuit to enable them to be track-fed without frying if the wick is turned up to 12 volts. Underneath view of 'the workings'. The gap between the electric contacts is bigger than it appears in this shot as there's a polystyrene spacer underneath one. The Sandy Cove Sand Co Musuem loco almost complete – still waiting for flashing hazard lights. The 1/24 scale V8 hot rod engine is from a 1/24 scale Revell 'Monogram' kit of a Ford Model 'T' street rod (the rest of the kit ended up like this). The radiator was adapted from a diecasting supplied as part of an Occre London B-Type Bus 1/24 Scale Model Kit (the rest is needed for a so-far-unannounced future project). The fuel tank and radiator header tank are adapted from cast resin 1/24 scale depth charges (!) supplied by an eBay operator trading as Battlecrafts. The seat, as already mentioned, was supplied by Cambrian Model Rail. The brake stanchion, gear lever, reverse lever, foot pedals and battery box were fashioned from the bits box. The driver is a composite of a standing LGB figure with legs from a figure supplied by Dorspring Models. Possible emblem for the radiator. V-8 engine suggests 'Octavia', although there is nothing much in common with the Skoda car of that branding. There must be a pun somewhere on 'five more than trivia', but the punchline is proving elusive. So far 'OctaVee' is as good as it's got, though the management are holding fire before inscribing this on the radiator in case a better suggestion arises. Speaking of trivia:- After leaving art college in 1976 and getting a 'proper job' for the first time the management of Whittlecreek and Eaton St Torpid Heritage Railway found themselves performing all sorts of roles within a small company based at Newhaven originally called the Independent Polymer Research Centre, or just IPEC; shortly before the management joined it had been acquired by Yarsley Research Centre (itself bought by Fulmer Research Institute, in turn owned by the Institute of Physics) and became YPEC. One of the more mundane tasks was running an injection moulding machine for a few days at a time. And the most mundane of the moulding jobs was ABS nameplates for the bonnets of Foden lorries (see photo below). The black background between the off-white lettering was handpainted by someone working from home in Newhaven. A Foden nameplate from the 1970s – just maybe one of those moulded by the management of Whittlecreek and Eaton St Torpid Heritage Railway. The least mundane of these moulding jobs was a circular 'dish'; the bosses were a bit coy about what it was used for but indicated it was part of some 'ammunition'. It was moulded in polyethylene to improbably tight tolerances – cost was no object in getting it right. A few years later the penny dropped: the only possible use could have been for casting TNT used in the shaped charges which initiate the main explosion in nuclear weapons. At Fulmer Research Institute in Stoke Poges colleagues were developing Kevlar body armour and helping to improve so-called 'Chobham armour' for tanks so the right sort of MOD clearances were in place. But most of YPEC's activies were unconnected with armaments. Improving the production of plastic parts for Black & Decker Workmates was the biggest project – a few years afterwards one of the preliminary test moulds was requested by the Science Museum for their collection of nationally-significant developments as this so-called 'hot-runner moulding' went on to become ubiquitous in the plastics injection moulding industry. YPEC also ran 'proving trials' on such moulds made to produce various mass-produced items – ones that come first to mind are threaded lids for containers, disposable razors, and the arms and legs of Palitoy's 'Action Man'. By late 1978 the management was given more onerous tasks, such as procuring equipment for the first injection moulding factory in Saudi Arabia, followed by a year at the University of Birmingham working on superplastic aluminium alloys. By mid-1980 the management was back at YPEC building the sophisticated temperature controllers needed for hot-runner moulding. Wiring up low-voltage motors and LEDs for models seems very mundane compared to three-phase controllers capable of controlling up to 100 kW of electricity – although most were less than half that capacity. In an overlapping role, the management began to write code to analyse the signals from instrumented impact testing. But this digression seems to have digressed too far already.